The Bill Graham Civic Auditorium is a well know and historic (built in 1915) multi-purpose venue in San Francisco, California. The arena was originally constructed to be a part of the Panama-Pacific International Exposition and, at that time, was named the San Francisco Civic Auditorium. In addition to concerts and conventions, it was also host to the NBA’s Golden State Warriors. The management of the auditorium wanted a new floor in their basement corridor, a very busy area during events. DSSG member Ogden Contract Interiors, Inc. of Potrero Hill in San Francisco was asked to put together pricing for a new floor. After seeing the old epoxy floor failing due to obvious moisture issues, they called in PolishedCrete, also a member of DSSG, to assess, evaluate, and recommend a solution. The client was not entirely sold as they had seen a couple of samples of polished concrete from other contractors and didn’t care for the finished look. Price saw the samples and noted the flaws and overall lack of quality and offered to do some samples on their floor. 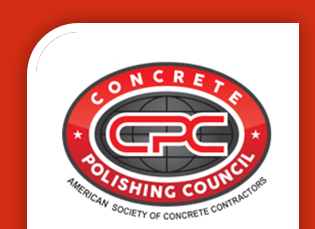 PolishedCrete operates a “fast sample” center in order to provide appropriate samples with short turnaround times so the client can make design choices right away. After seeing the new samples, the client gave the go-ahead and the floor prep and polishing started. 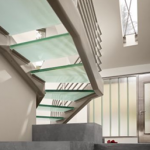 Ogden and PolishedCrete/BAC are all part of the Decorative Surface Solutions Group (DSSG), as are Proseco (used for the polish chemicals) and ProCrete who supplied the diamonds to complete the project. 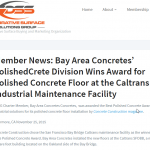 PolishedCrete is a division of Bay Area Concretes, Inc.